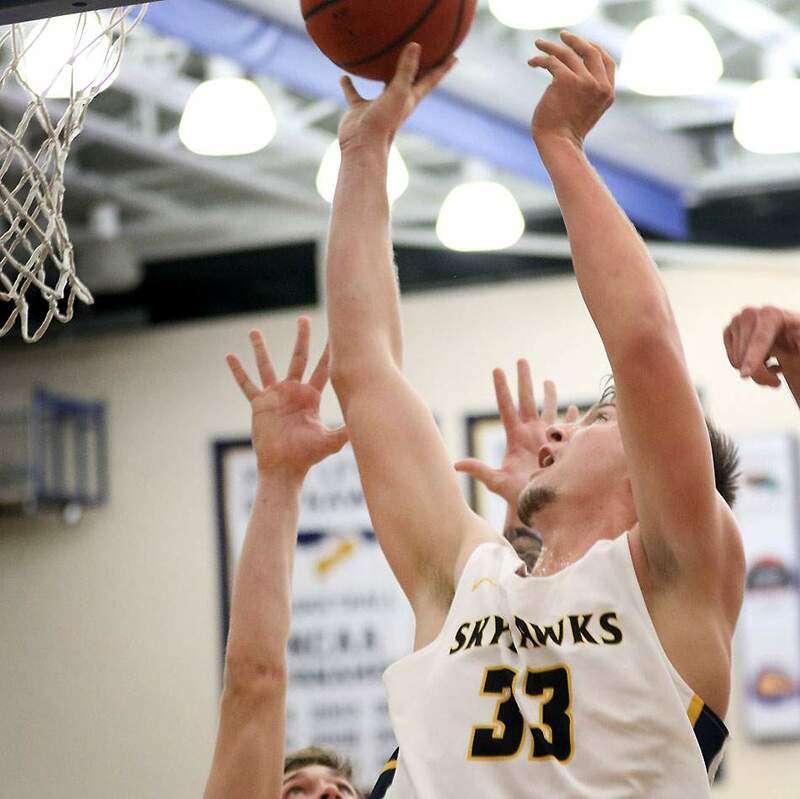 Brendan Boatwright of Fort Lewis College had 10 big points, four rebounds and two blocked shots Saturday night against rival Colorado Mesa University. His last blocked shot helped FLC win the game, 79-76. Alex Semadeni made his second highlight reel game-winning basket of the season, and Brendan Boatwright had the biggest blocked shot of his young career, as Fort Lewis College closed out 79-76 home rivalry win Saturday night against Colorado Mesa University. Colorado Mesa’s Tommy Nuno made a tough shot over Boatwright to tie the game at 76-76 with 43 seconds to play. Semadeni responded. The Skyhawks (9-8, 4-7 Rocky Mountain Athletic Conference) drew up a play for point guard A.J. Sparks to drive to the basket, but the Mavericks (12-5, 7-4 RMAC) defended it well and sent Sparks to the top of the 3-point line. Semadeni clapped his hands and asked for the ball. Sparks passed it to him, and Semadeni dribbled twice before he used a spin move to drive to the basket. He got into the lane and finished with a layup off the glass to give FLC a 78-76 lead. The next trip down the floor for Colorado Mesa was well defended by the Skyhawks. Nuno tried another contested shot but missed, but Michael Skinner got an offensive rebound. Mesa had a few options, but a pass was kicked out to Jess Spivey for a 3-point try. Instead of crashing on the man driving to the basket, Boatwright, a 6-foot-9, 250-pound redshirt freshman, ran out to the wing to defend the open shooter. He got his hand on the Spivey shot, and the ball went straight into the air and was rebounded by Will Wittman, who was immediately fouled with 4.2 seconds to play. Wittman made 1-of-2 free throws to give FLC a 79-76 lead. With 3.4 seconds to play, Mesa had the ball across half court and called timeout. But star Connor Nichols had fouled out with 1:28 to play, and Mesa struggled to get a clean look. Skinner attempted a corner 3-pointer as he faded away from the basket with Wittman in his face, and the shot was no good with no time left for Mesa to get another chance. FLC turned in a total team effort one night after the three seniors, Marquel Beasley, Otas Iyekekpolor and Semadeni, carried the team past Western Colorado University. Beasley played hurt all weekend, and his ankle injury worsened Saturday. He was unavailable the final 2:47 of the game after he made a big shot but fell awkwardly. He finished with 12 points in 31 minutes. Sparks and Wittman tied for a team-high 14 points, while Semadeni scored 12 and Boatwright had 10 to go with two blocked shots and four rebounds. FLC started the game red-hot shooting from 3-point range at 8-of-10. The Skyhawks cooled to 12-of-29 for the game and found more success driving to the basket in the second half. Semadeni and Sparks each went 2-of-3 from 3 with a pair of big shots early after FLC went down 6-0 to start. Keven Biggs came off the bench and made two more big 3s, while Wittman was 3-of-6 from long range. It all helped FLC build a 44-37 halftime lead. FLC played brilliant defense all night, and Pietrack credited associate head coach Daniel Steffensen for scheming a way to slow down a Mesa offense that entered the game averaging 84.7 points per game, second most in the RMAC. Iyekekpolor played stifling defense on Nichols, the RMAC’s leading scorer at 22.4 points per game. Nichols finished with 16 points on 5-of-15 shooting and was 0-of-4 from 3. He had a key technical foul early in the second half when he took out Wittman dribbling around the 3-point line. The foul sent Pietrack into a frenzy on the bench, and the refs reviewed the play and eventually ruled it a technical. Nuno led the Mavericks with 17 points, eight rebounds and seven assists. One night after the FLC bench had only 15 points, it came through with 44 points Saturday. Suddenly, FLC is only one game back of being tied for eighth place in the conference after the tough start that included three overtime losses and a one-point loss in a game that saw 86 combined free throws. The team will hit the road for four consecutive games beginning with a trip next week to Denver to face Regis on Friday and Colorado Christian on Saturday.